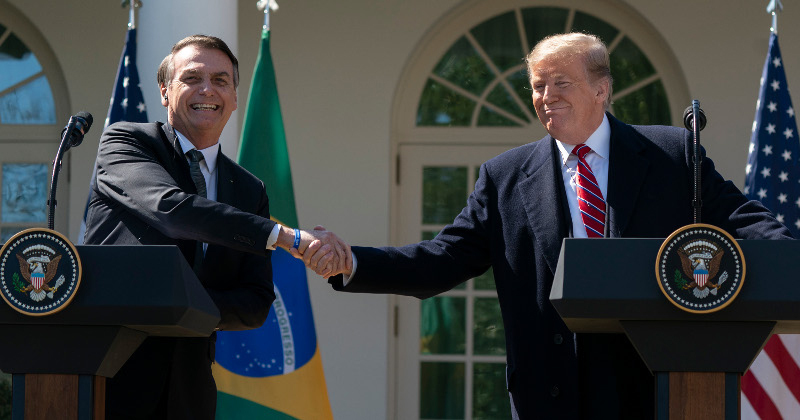 President Trump and visiting Brazilian President Jair Bolsonaro took shots at the mainstream media during a state visit at the White House, with both men attacking the “fake news” at a joint press conference. Bolsonaro, who has often been called “Trump of the Tropics,” is on his inaugural trip to the U.S. since his stunning election win, culminating in today’s highly-anticipated first meeting between the kindred nationalist-populist leaders. Later in the press conference, President Trump praised his counterpart’s adoption of Trump’s signature ‘fake news’ phrase, asserting that their election wins were made all the more improbable by relentless negative coverage by globalist media. “I’m very proud to hear the President use the term ‘fake news,’” Trump said, gesturing towards Bolsonaro. Bolsonaro also expressed his confidence that President Trump will be reelected in 2020. President of Brazil, Jair Bolsonaro, and President Trump are meeting today at the White House. Alex delivers commentary on this breaking news.